I curl up with a good vegan cookbook like many others do with a novel. I have at least 50 favorites that I refer to regularly for inspiration, and am always adding to my collection. Alicia Silverstone’s The Kind Diet, is one of those really enjoyable books that I just had to read cover to cover. This New York Times bestseller provides a gentle introduction to vegan living, and explains why a plant-based diet offers benefits for our planet, and can be a catalyst to health for many people. Even vegans need treats now and then, and one of Alicia Silverstone’s recipes is for “Oatmeal, Walnut, and Dried Plum Cookies.” It is a nice combination, and an unusual one. But it’s not for everybody, and I had a hard time selling either walnuts or dried plums to the crew at home. I have put my own twist on those cookies, eliminating both the dried plums and the walnuts, and adding chocolate chips and dried strawberries instead. I made several other changes too, most significantly swapping in white whole wheat flour instead of the all-purpose flour in the original recipe. I reduced the oil from 1/2 cup to zero, added extra vanilla, plus a little soy milk. I also make these cookies larger than the original recipe, and increased the baking time. Just a quick note about dried strawberries. They are not quite as common as other dried fruits, but can usually be found at both Trader Joe’s and Whole Foods. 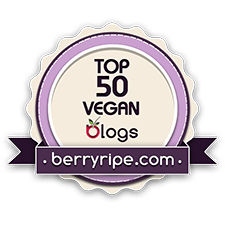 If you are new to vegan baking, you may not realize that most supermarket chocolate chips declare milk products in the ingredient list. Happily, Trader Joes makes semi-sweet chocolate chips without dairy, and so do several other companies. But always read the label to be sure. My non-vegan husband (he calls himself half-vegan) said, “These cookies are too good.” My son, who is usually completely whole-wheat-averse, ate the cookie dough raw. I am not recommending this practice, but as he pointed out himself, it is safe because this dough has no raw eggs. Leftover cookie batter, if you have any, will definitely stay fresh in your refrigerator for a few days. 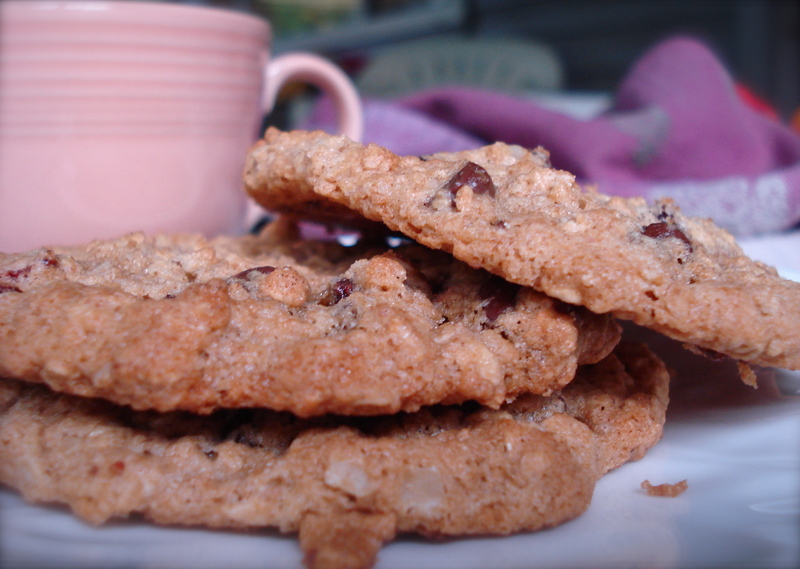 These cookies are great in a lunchbox, or a yummy treat with a late afternoon cup of coffee. Official results are in, at least at our house: Two thumbs up. Whisk together the oats, flour, sugar, baking powder, baking soda, and salt in a large bowl. In a medium-size bowl, mix together maple syrup, soy milk, applesauce, vanilla, and molasses. Combine the wet ingredients into the dry ingredients. Add the chocolate chips and dried strawberries, and incorporate well. Scoop heaping 2 or 2 1/2 tablespoon-size balls of cookie dough onto parchment paper, leaving room for cookies to spread during baking. Flatten tops slightly. Bake for approximately 10 to 12 minutes, or until golden. Transfer to baking rack to cool completely.